We have a month full of good times just waiting for you. All month long, the gorgeous art of Sarah Kraft is featured in Empire's Art Gallery. Be sure to join us for her art reception on December 17. We're all about the bands -- especially Ghoul School and Dog Rifle! They're playing Empire's After Hours on December 16. Check out their melodious tunes and then come see them live in the shop. THIS FRIDAY, we're bringing all the best laughs and putting them into the shop for Empire's After Hours' Stand Up Comedy. This is for mature audiences only (i.e., not for the kids!). On December 8, join our comic book discussion group as we talk about Empowered (Vol. 1) by Adam Warren. A whole bunch of us from the shop are going to see Rogue One on December 15. Want to join us? There might be space. 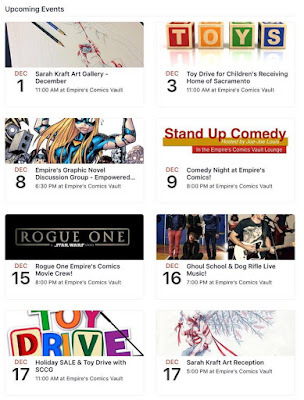 Finally, our annual TOY DRIVE with Sacramento Comic Creator's Group runs through the 17th. Please bring toys and other gifts for children in need. We'll deliver them to the Sacramento Children's Receiving Home where they'll be placed with children. If you want to go above and beyond, check out their Wish List.